I have 13 IP addresses that I assigned to eth1 interface that I will use and WAN. 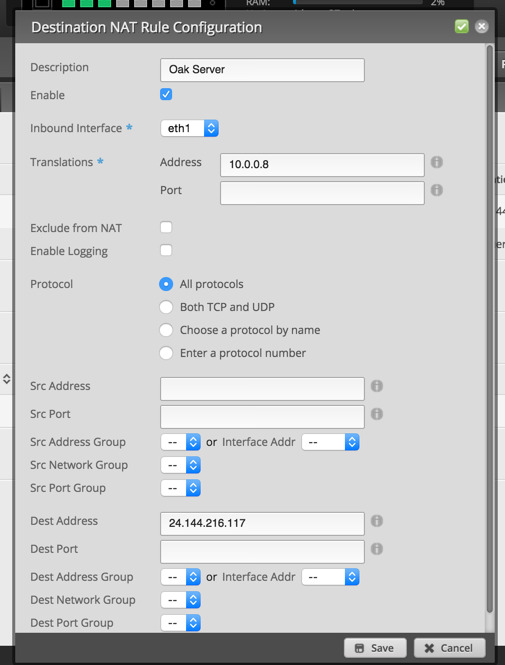 I want to map an IP address (one of 13) on eth1 to any of the networks local IP (eth0 or eth2 ) address on a group(can I group ports) of web ports (tcp 80, tcp 443, tcp 22, tcp 21 etc). the problem with this is. my brother uses an app on his iphone to play music onto his xbox over the network. so because he is on a seperate ip now it does not work. if i could somehow give it that second ip through the ERL and allow the xbox to talk to the rest of my network on another ip that would be great. kinda doubt its possible though. very lucky i even have 2 ip's in the first place to solve this UPNP issue with the ERL. patiently waiting for the 1.5 beta with miniupnpd support. Unfortunately this need source NAT rule need to come before the masquarade rule, so we can drag-n-drop it to be the rule source NAT rule and then click "save rule order". Then the last thing is add a firewall rule to allow 192.168.1.10 (note DNAT happens before firewall). It's worth noting that now all in bound traffic to 172.16.3.61 to forwarded to 192.168.1.10, so that internal server has effectively no firewall at all protecting it. This maybe what is desired, but if not the destination NAT rule could add states "establed/related" so that only session initiated from the server are allowed in. Attached is the complete config.boot file for this example. ok, but what i dont know how to do or if i can do is how to pull the second ip to the same router. im getting dynamic IP's, and im about 99.99% sure only 1 ip can be attached to the mac, so essentially i would have to make the router advertise 2 mac addresses, if this is possible, how would i do it? i could do 1 ips through 1 port or 1 ip through each port and use 2 as i am only using 2/3 of my ports now and have a free one. I seem to recall people have done that with psuedo-ethernet interfaces. Trying to do exact same setup like this but having issues. See this thread for config info. Can you please tell how to make server 172.168.3.61 accessable from LAN in this example? (I don't want to use local IP address 192.168.1.10, since there is domain name that always resolves to 172.168.3.61). I have followed this tutorial to a T but when ever I try and hit the external IP address it just takes me to the Routers' management Login instead of using NAT. Anyone can help with this? Maybe I need to configure some loopback for NAT? @AndrewDryga this is an old thread. I'd suggest you start your own thread. Post your config file, software version and the question. The answer was in post #3. I'm just replying to this post because I can't find a post related to it. The answer for me isn't made in post 3. I have one LAN (192.168.1.x) and 16 public addresses. I just want to forward ports from different WAN addresses to diffirent LAN addresses. So e.g. address 190.x.x.2 needs to be forwarded to 192.168.1.10 on port 25. Also address 190.x.x.3 needs to be forwarded to 192.168.1.20 also port 25. I have made these configurations on many firewalls (Cisco, TMG, Netgear) and this works without any problems. On the EdgeRouter Pro 8 only the primairy address is working. 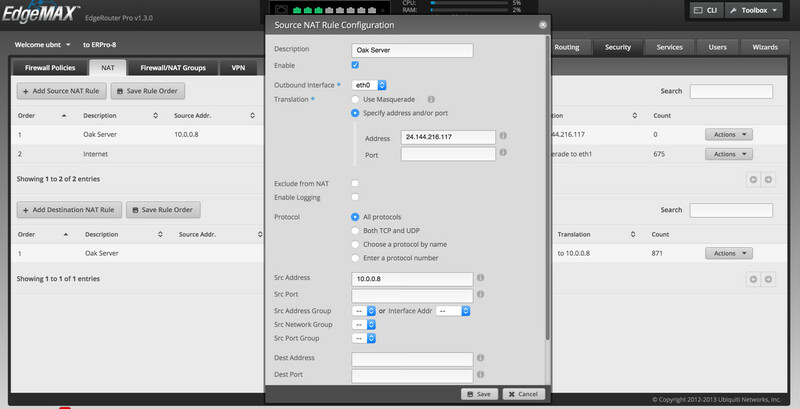 I've configured several routers now (EdgeRouter) without any problem when it handles only 1 public address. The need is for replacing several TMG firewalls. Anyway I've made configs with DNAT as discribed, nothing works, only the primairy address. I'm getting a bit frustrated, as specialy with the solution of the support team saying to join the forums and find the answer there. Until now I didn't find any answer or suggestions. So this will be my last try otherwise I will replace the EdgeRouters with Netgear or Cisco. This isn't ment to be a treath but I have to go for a solution. Question: Am I the only one with this problem, is there a solution (config example and not the one above because this didn't work for me). If there is more info needed please let me know. hello @CVelt I'm having the same issue, were you able to resolve it? No untill now I didn't sove it. The config is exactly as disscibed. I also didn't spent much time to it. Going back to the old firewalls with no problems. I just did it, update to the latest version add all my Static adress to the interface that connect to my ISP, and create DNATs for each one! You and I are trying to do exactly the same thing, and we are at exactly the same frustration level. These people have no idea how poor their documentation level is. They do not utilize thorough examples within the users guide that pertain to the product at hand, many of the examples on the forums only work on the lite version of the product and not on the pro... Most of the posts I have read are only pertinant to specific configurations that are used in ISP and Hospitality environments and If you want to do anything else like the situation you described you are in dark territory. I simply want to take my block of 16 addresses and assign them on my WAN port with the router HTTP interface only coming up on the first one in that block, and only then on a designated management port that I choose. Then I want to be able to add the rest in a list (which I know how to do already) and be able to build port forwards to have the packets that come to those addresses forward to other subnets on other interfaces on the router where I will feed switches with staticly addressed devices on them. DHCP will not be in play. I have built out all of the firewall config and port forwarding rules, just every time I access any of the addresses from outside all I get is the management interface. If I try any other port nothing gets through. I can follow directions, but they don't put out clear directions for anything... they want you to ask/answer...ask/answer If you want that then have a private email support que, I don't want to publish my router configurations to a public forum!